Life as a Conservation volunteer in the Amazon Rainforest is hard work but it can also be incredibly rewarding. Think about what it be like to spend your days working in the wild greenery of Peru. Imagine helping with the rehabilitation of wild animals and hearing the sounds of them waking up in the reserve. Nothing can beat the feeling of being in the jungle, and the knowledge that you are protecting it. Our project is based at the Taricaya Ecological Reserve. 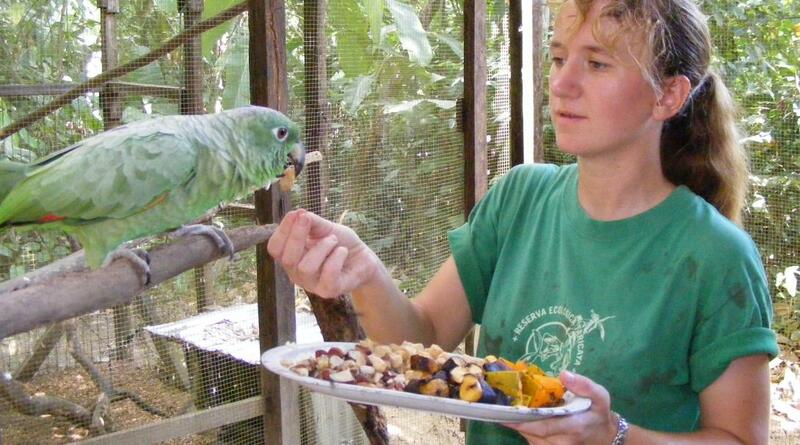 Our main focus is to complete biodiversity studies but we also opened an animal rescue center; the first of its kind in Peru. Here, we provide care and rehabilitation to injured, abused, or neglected animals before they are released back into the reserve. But who better to capture the real essence behind the project than Stuart Timson, the man who co-founded the reserve almost 20 years ago with Fernando Rosemberg. 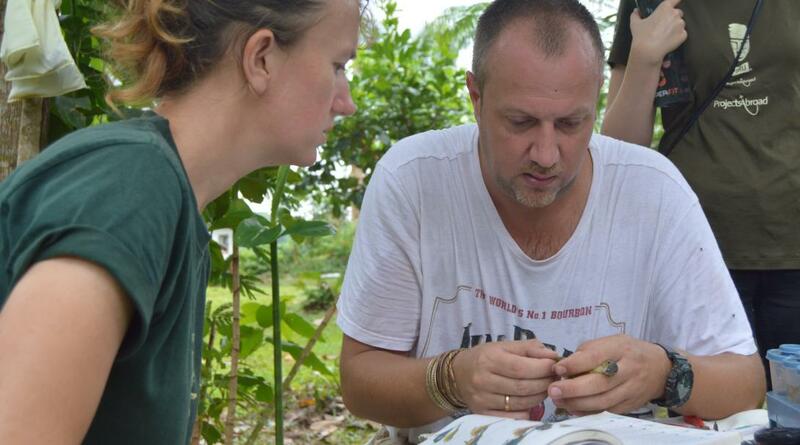 Stuart Timson, a qualified biologist, is our Conservation Director in Peru. He’s one of the true inspirations behind this project. His passion for the work is evident the moment you meet him. “It’s hard not to get excited talking about what you’ve been doing for the last 20 years!”, says Stuart. Through the rest of this blog post, Stuart will take you by the hand, detailing every aspect of life as a Conservation volunteer in Peru. He’ll describe a typical day in the heart of the Amazon Rainforest, because he knows it better than anyone. And you never know, if he’s able to convince you, he may even guide you in person this year! Every day you wake in your shared bungalow as the jungle comes to life before the sun even appears. Birds mark their territories with sharp piercing calls. Howler monkeys announce the new day with a deafening roar from the canopy tops. In just a few minutes, the sun rises at the lodge and you’ll prepare for the day´s many tasks and projects. 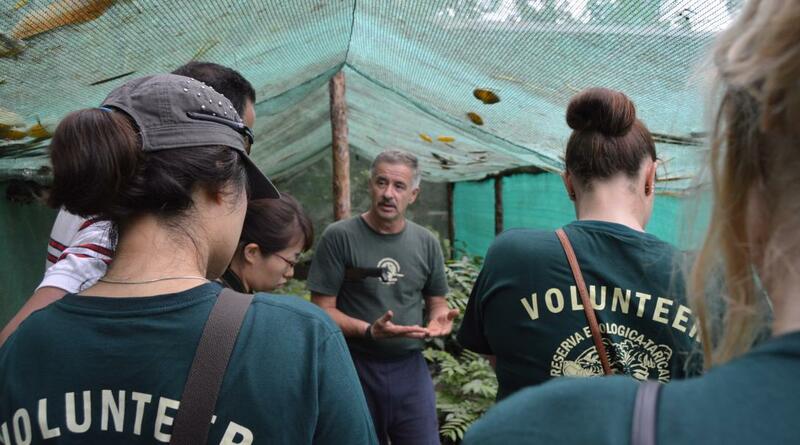 Early in the morning, you’ll get involved in various conservation projects in the Amazon Rainforest. These consist of bird surveys where you'll collect data from different platforms. This includes the highest canopy platform in South America. Here, you’ll gaze down over the magnificent forest from a 42m high perch in an emergent kapok tree. You’ll see flashes of dazzling colors as the feathers of macaws, parrots and toucans catch the early morning light. Other activities include food preparation at the animal rescue center or opening mist nets with a resident biologist. We catch birds in the mist nets, record the data and then release them. This activity serves to record data on the 507 registered species in the reserve. With this, we can keep an eye on numbers or any change in their behavioral patterns. And if you’re lucky, you may even discover a new species! Once morning activities are completed, you’ll head back to the lodge. A healthy breakfast will be served before you are split into groups to complete the next set of projects. After breakfast, you may find yourself at the animal rescue center. You’ll weigh and measure food to suit the diets of all the different animal residents and head out to the cages to feed them. This is a fantastic opportunity to learn more about the history of these animals. Many of them arrived in heartbreaking conditions, having spent years in captivity suffering from abuse and neglect. Others were in need of rehabilitation after surgeries or injuries. Every animal has a unique story to tell. They forever remain a part of our Peruvian family whether they are in the rescue center or released back into the reserve. Other volunteers arm themselves with brooms, brushes, and supplies to clean the enclosures. Their work means that the animals are well kept, relaxed, and disease free. Another group will head out into the forest to collect branches and logs. These enrich the enclosures, giving the animals perches, climbing frames and stimulation as they prepare for a return to the wild. During this time, our resident vet performs check-ups and monitors the health of the animals in our care. These include annual health checks and medical interventions when necessary. This part of the day is especially beneficial if you are interested in veterinary medicine. You’ll get to observe the procedures and learn more about how the vet works with the animals. Every once in a while, there’s the immense satisfaction of participating in an animal release. 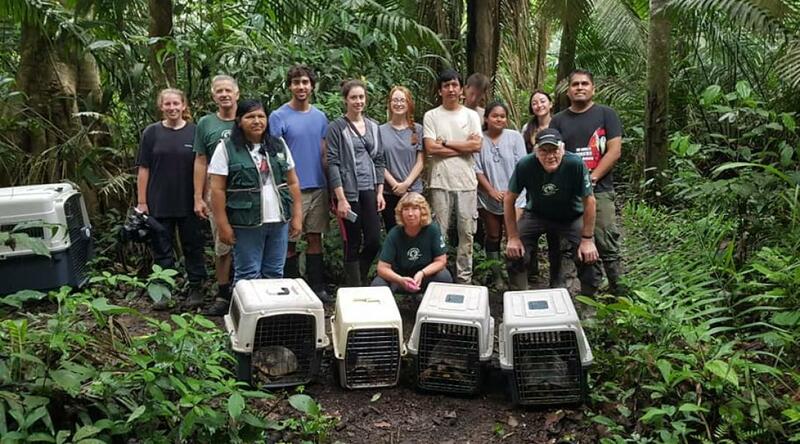 Most recently, our volunteers got to assist with the release of howler monkeys. Months or years of hard work all seem worth it when you can open the door and put a creature back where it belongs. A place where they shouldn't have been taken from in the first place! If today isn’t your day in the rescue center, then you’ll assist with motion sensor camera data collection. These small cameras are strategically placed around the reserve where it captures amazing footage of the animals we rarely see. 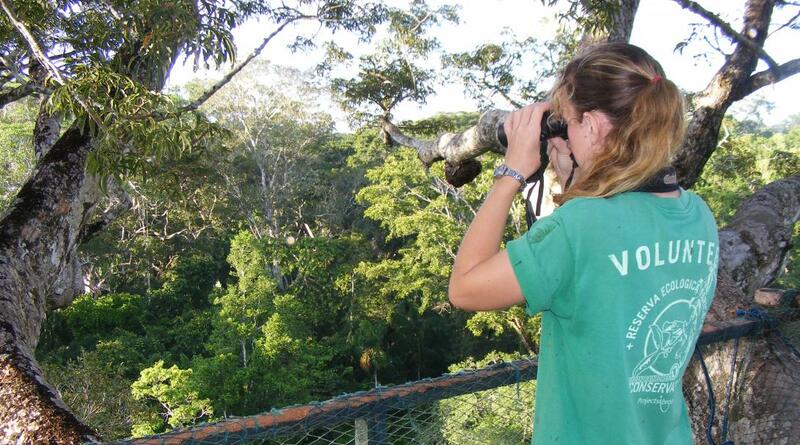 This unobtrusive study technique enables us to monitor the wildlife in the reserve 24-hours a day. From jaguars to monkeys, deer to pumas, and coatis to ocelots. Watching these animals in their natural habitat is a sight to behold. Whilst out you may come across a group of released Peruvian spider monkeys. A sight that wouldn’t have been possible 10 years ago! After near extinction due to habitat loss and poaching in Peru, our Conservation volunteers reintroduces the once-vulnerable Peruvian spider monkey population back into the wilderness. 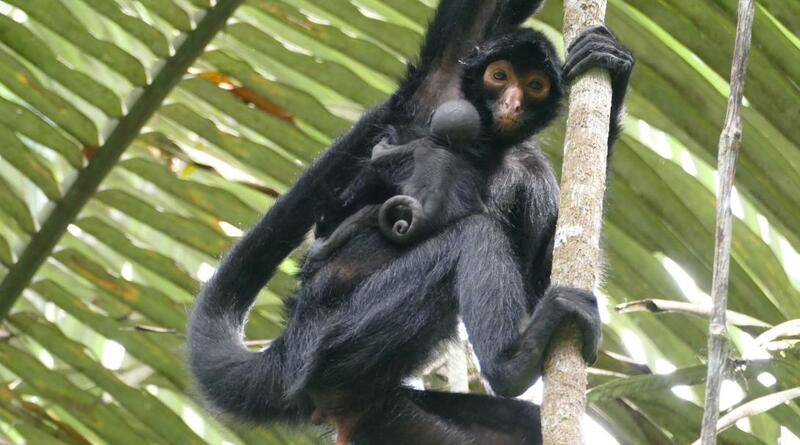 Today we can proudly say that we’ve rehabilitated and released several monkeys back into the wild, and recently welcomed the birth of a seventh baby spider monkey. Every released monkey has a radio collar attached before their release so that we can record their everyday movements. You may even run into a few volunteers tracking and monitoring the Peruvian spider monkeys with telemetry equipment. Later in the morning, you might encounter other volunteers armed with machetes and clearing our extensive trails. With a network of 57 km of GPS-mapped trails, it’s a constant battle to keep them free to allow our research work to continue unimpeded. After a tiring morning´s labor it’s back to the lodge for a good lunch and a rest. The midday sun is fierce and it’s easy to adopt the local custom of doing little until the heat passes. Reading, resting in the hammocks, or playing cards are favorite past times. After your batteries have recharged, it’s back to work as Taricaya comes alive again during the few hours before dusk. In the late afternoon, you’ll feed the animals their second meal at the rescue center or collect fruits from our pilot farm to feed us and the animals. If you are looking for a quieter activity, you can input the data collected from the various research activities that took place during the day. This data is then used to monitor populations and decide on crucial environmental policies that’ll benefit the reserve in future. Other volunteers head out with handheld nets to collect butterflies for study or check the permanent butterfly traps located around the reserve. 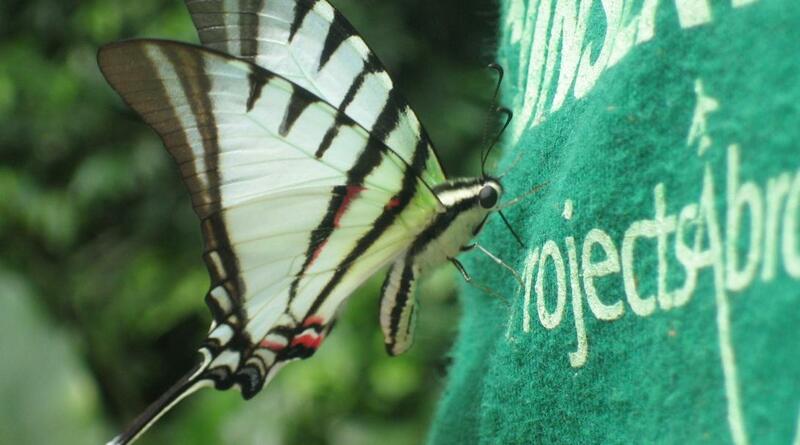 Whilst some are out and about in the forest, others are closer to home working on the mahogany project. We grow vast fields of mahogany as they serve as examples to local farmers that reforestation isn’t only possible, but effective. You’ll even to fashion souvenirs from wood to take home as a parting memory from the reserve. Depending on the time of year, you may be lucky enough to assist with our turtle project. You’ll get to patrol local beaches and collect turtle nests before poachers have a chance to steal them. Watching the babies hatch and knowing they’ll soon be released back into the river is a reward in itself. Back at the lodge, the evenings are generally quiet with dinner being served at 6.45 pm. Common activities include watching TV, reading and chatting with the rest of the volunteers. With the closest town, Puerto Maldonado, being 75 minutes away by boat, this is the perfect place to get away from the city and unwind in the midst of nature. Other nights there will be a talk or video presentation on the reserve work and some of the more interesting animals we live with. These talks are given by our resident staff who are experts in their given field. We all have plenty of knowledge to share, so ask up plenty of questions. We also love to share a story or two about life in the reserve! However, not all evenings are quiet. On one of the nights, we’ll take you out on what’s deemed as the volunteers’ favorite activity. We’ll take you to the river to search for the elusive but magnificent caiman, a large reptile that belongs to the same family as an alligator. We want you to volunteer and experience the mystical Amazon Rainforest late at night and watching the caiman’s float under the stars is the perfect way to end the day. Since the start of this project, the reserve has become a pioneer in so many fields of both conservation and scientific research. It’s internationally recognized and has been published in numerous studies. However, none of this could’ve been possible without our volunteers. Every meter of trail, every animal enclosure, every data point collected has been thanks to the hard work and dedication of so many people from all over the world. Volunteering at Taricaya will teach you about hands-on conservation and working with various animals in need of rehabilitation. You’ll see and encounter animals and plants you wouldn’t believe existed. But perhaps most importantly, you’ll form life-long friendships with other volunteers and staff who’ve similar passions. I’d like to say thank you to every last one of you. And if I haven’t met you already, when will you get here? Our Amazon Rainforest Conservation Project in Peru is waiting for you! 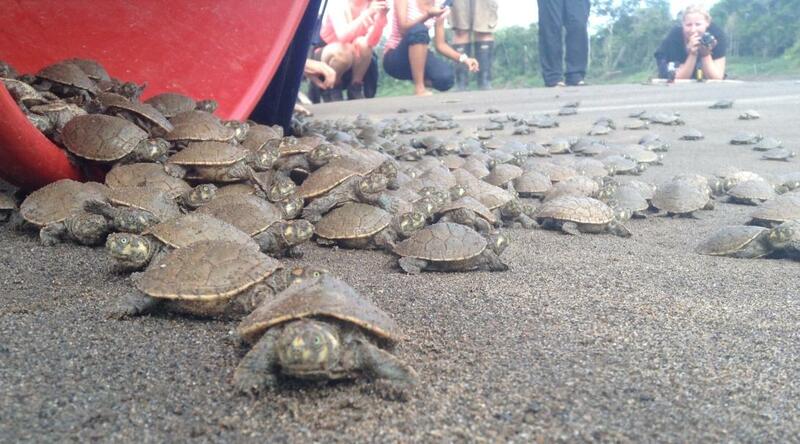 Want to know more about our Conservation Project in Peru?